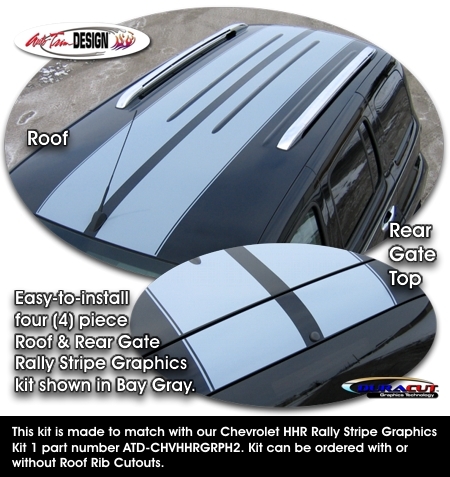 Make your ‘06-'11 Chevrolet HHR "Tough-looking" with this awesome Rally Stripe graphics kit. Easy-to-install kit is packaged as a set of six (6) pieces with a classic .20" (5.08mm) pinstripe at the outside perimeter as shown. They're PRECUT and ready to install in a wide variety of colors - NO TRIMMING required! Stripe package is not just a set of 10" (25.40cm) strips in a box. Graphic kit consists of prefitted, tapered and contoured pieces as shown in the illustration. 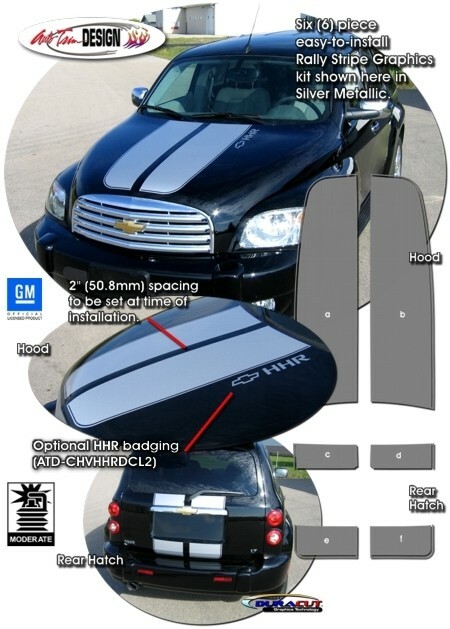 This kit is specifically made for the '06-'11 Chevrolet HHR factory hood and rear gate areas and will not fit any other vehicle. Rally stripes are set for 2" (50.80mm) center spacing at time of installation. Optional "HHR" Badging Kit comes with three (3) decal sets.